After the order is placed you can send the photo you wish us to use in the video by email. High quality photos are best and must be facing straight forward. Please include child's name and the DVD ordered. 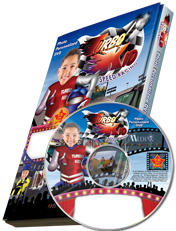 This Photo Personalized DVD features your child as the speed racer "Turbo Kid". Jump in the driver's seat, take the lead, and compete against other drivers for the championship title. The high-speed, high-energy extreme sports provide the ultimate adrenaline rush. This video encourages healthy competition, thrilling motivation and extreme fun.The child's picture is used 40 times. Length of DVD is approx. 23 minutes. First name will be printed on the first line on the label.